So I have been using (and LOVING) eMeals for meal planning. I adore the easy-to-prepare, yummy recipes. 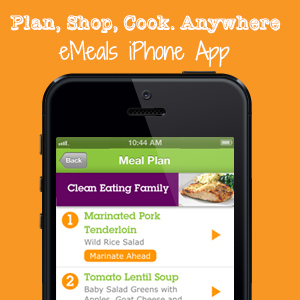 eMeals created an iPhone app! So now I can access my meal plan, grocery list, and recipes on the go. It seriously takes meal planning to an even easier level because I can access my meal plan anywhere. And the app lets you customize much better than the emailed plan. If you don’t like a meal, you can delete it…and it deletes the ingredients from your shopping list! You can also add extra stuff to your list, so you can shop just from one list (instead of your meal list and other list). SUPER awesome. And I’m going to download the app to Tyler’s ipad so I can cook right from the app’s directions. No more printing out my meal plans! It is a great way to “go green” with my dinner planning. Check out eMeals! We LOVE the Portion Control plan. And the recipes have been YUMMY so far.